Many times we limit ourselves by our own thoughts. If you think you can not do something, well guess what you can not do it. If you remove limiting thoughts and be open to all of the great things come your way, you will be pleasantly surprised. I have hear people say, “I could never do that”, well that thought is getting in their way. A perfect example is public speaking. many people have a fear of speaking in front of a group of people. What is that fear really about? Fear of not doing a good job? Fear of being judged by other people? Once you breakthrough the fear and be open you will realized that very few people are born excellent speakers it is something you can learn an practice to become good at with experience. 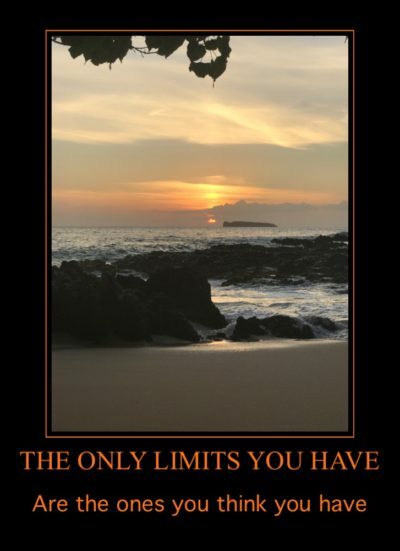 Get out of your own way, be open and push your limits….